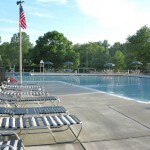 The pool was renovated in 2009, and has over 280 members/families. 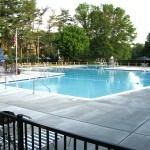 One section of the pool is dedicated to youngsters, with a depth of 2 to 3-1/2 feet. The main pool area has 6 lap lanes (25 meters), and there are 2 diving boards in the deep end. There is a separate wading pool with a shade structure for little kids, a playground, basketball, volleyball and shuffleboard to keep the kids busy during adult swim! The pavilion has 8 picnic tables and 2 gas grills, as well as a fully stocked snack bar.